Wayland is focused on the low-cost production of cannabis in large-scale greenhouse operations and expects a significant reduction in its cost of goods sold per gram. The Langton facility is expanding in a multi-phase project. The first stage, which includes 217,000 square feet of space and an annual capacity of 36,000 kilograms, is slated for completion in November 2018. Construction on an additional 635,000 square feet of grow space is set to begin in the second phase, which will increase annual capacity up to 105,000 kilograms. This phase is slated for completion in April 2019. By then, the company expects to have production capabilities of 2,023 kilograms of dried cannabis per week. On November 8, 2017, Health Canada granted the company a new license, which increases capacity to 6,250,000 grams. The previous license allowed for 1,282,000 grams (930 kilograms of dried marijuana and 352 kilograms of cannabis oil) per year. The license is valid until October 9, 2020. Wayland Group also received a sales license from Health Canada for expansion in Norfolk, Ontario. Wayland has applied for a German license (expected in Q3 of 2018) and is in the process of building out a large facility near Dresden, Germany. 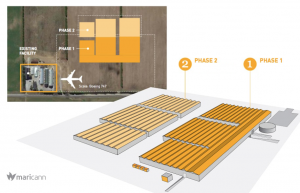 The facility, GMP and GPP compliant, will have up to 300,000 square feet of cultivation space. Patients’ cannabis prescriptions will paid for by German government’s health insurance and European Medicines Agency. Germany has reciprocal trade agreements with Canada and German Parliamentarians voted unanimously January 19 in favor of the new “Cannabis as Medicine” law, which came into effect March 2017. A new MMJ program in 2017 will allow the company to expand throughout the European Union. The facility has received Good Manufacturing Practices and Good Distribution Practices certifications from the EU. Wayland finalized the acquisition of Haxxon AG in Regensdorf, Switzerland in May 2018. Haxxon cultivates female hemp cannabis flowers with less than 1% THC at a 60,000-square-foot facility. Wayland plans to upgrade the facility and increase production by a factor of six.